Start the phone with an alternative network SIM card (not the original network). If the phone prompts you to enter MEP Code or similar, go directly to Step 8, otherwise follow these instructions from Step 2. Using the menu button go to Options. Type MEPPD (you will not see any typing - if MEPPD does not work, try MEPD). This should display the status of the five locks. Type MEPP2 (you will not see any typing - if MEPP2 does not work, try MEP2). You will need to press and hold the Alt key (pictured above) to get the number 2. You will now be prompted to enter the MEP Code or similar. Key in the first of the two codes you have been supplied and press the Navigation Key / Trackball. Switch off the phone, remove and then re-insert the alternative network SIM Card, then switch the phone back on - the phone should now be unlocked. If the phone remains locked, please repeat the procedure using the second of the two supplied codes and type MEPP4 at Step 6. Type MEPD (you will not see any typing). This should display the status of the five locks. Type MEP2 (you will not see any typing). You will need to press and hold the Alt key (pictured above) to get the number 2. You will now be prompted to Enter MEP Code or similar. Key in the first of the two codes you have been supplied and press the Navigation Key / Trackball to accept. If the phone remains locked, please repeat the procedure using the second of the two supplied codes and type MEP4 at Step 6. 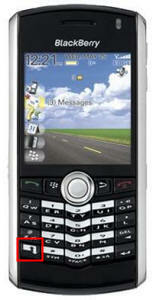 Start the phone with an alternative network SIM card (not the original network). If the phone prompts you to enter MEP Code or similar, go directly to Step 10, otherwise follow these instructions from Step 2. 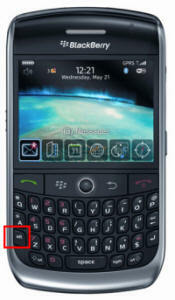 Press the BlackBerry Button (pictured on the right) and select Show Keypad. 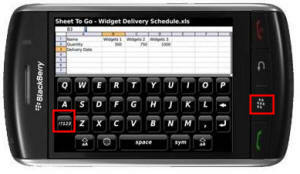 Turn the phone on it's side to give a full keypad (see picture above). Type MEP2 (you will not see any typing). You will need to press and hold the Numbers key (pictured above) to get the number 2. Key in the first of the two codes you have been supplied and press Enter/Return. If the phone remains locked, please repeat the procedure using the second of the two supplied codes and type MEP4 at Step 8.